It’s been pretty quiet this year on my blog, but it hasn’t been quiet in my sewing room! The year has gotten away from me somehow – planning a wedding does that to you! 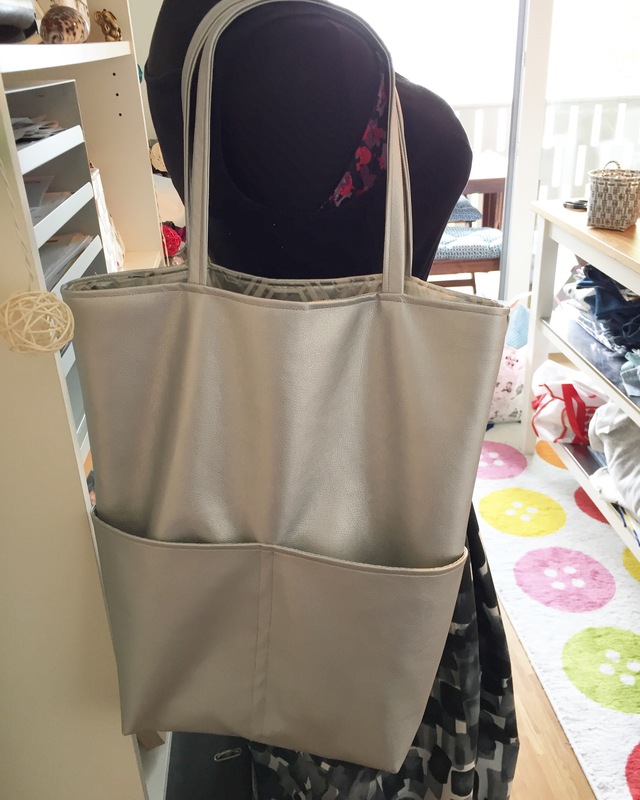 Now the wedding is over I’ve had some more time to devote to my sewing room (and my blog) and wanted to share probably my most used make of all time with you … my oversized silver tote! I got this amazing silver pleather for the grand price of 9 Euros/m! That’s a bargain if you ask me! I also bought it in gold and navy blue – it’s really good quality and looks very close to the real deal. We have an amazing fabric shop in Frankfurt just called ‘Stoffe’ (fabrics) which is a real treasure trove. They buy remnants from big manufacturers and you can find some pretty good bargains there. The service is really friendly too! This bag was a self draft – my old accessorize tote with handy front pockets had died and I was dismayed to find there weren’t many with front pockets on the market. After much hunting I did find one … with a tasty 100 Euro price tag!! I decided surely I could make one cheaper than that – it’s just a tote bag with pockets after all?! I mainly use a tote when I want to carry a whole load of stuff – my work notebook, my kindle, my cardigan, an umbrella for the ever changing Frankfurt summer weather so I went for it and made this guy big! It probably turned out a bit bigger than I really needed, but have come to love it’s over-sized proportions. I really enjoyed the challenge of working this out as I went along – this was a rare project where I really took my time as I was so keen for it to work out well! Also I really didn’t want to have to unpick anything and leave nasty puncture marks on my pleather. I’m glad I did – I’ve used this tote for the whole summer now. It’s been to work, it’s been traveling, it came with me on my honeymoon! There’s nothing it can’t do! And it turns out metallics are a winner – they really do go with everything! The inside of this bag is lined with some gorgeous fat quarters that a friend brought back for me from the states. They have a silver geometric print on them which goes so well with the outside of the bag! The pockets are lined with them too! I love it when you dig something out of your stash and it’s the perfect accompaniment for your project! My only regret with this bag is not adding in a magnetic closure at the top or maybe even being bold enough to add a zipper to the top. I will definitely do that on my next one – I’m already planning a navy blue version for use in the winter! I also made this cute little clutch for my friend to use as her bridal clutch from the remnants of the silver pleather. What do you think? I’ve always had a bit of a love for buying bags so knowing I can make my own is a real treat! I see my bag collection expanding …. As I’ve had a bit of a run recently on making baby clothes, my baby fabric stash was in *desperate* need of re-stocking. (Disclaimer: my definition of desperate comparative to others may vary!) I’d received a voucher code from stoffe.de and thought it was a good opportunity to bump up my stash. Stoffe.de are really reliable and very well priced. Some of these jerseys cost nearly twice the price at my local fabric store. Obviously as they buy on mass they are better placed to be able to negotiate on price and where I can I try and support my local store – it’s all about trying to find that balance! I tend to keep a stash of baby fabrics as baby projects are those that I just dip in to when I have an hour or two to spare. They’re there for when I feel like making something or need a kick start to my sewjo. 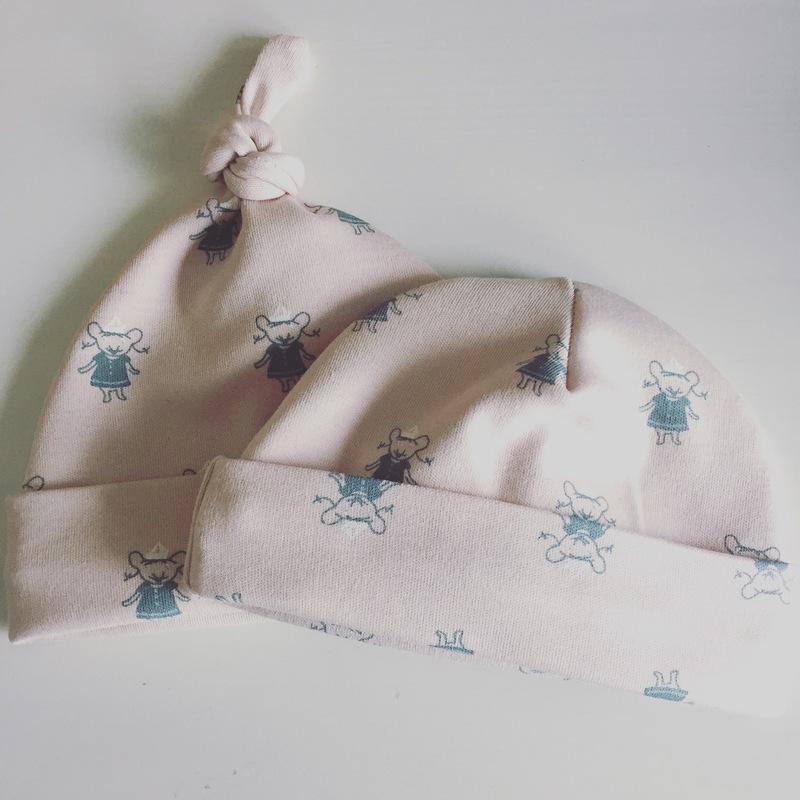 I’ve recently been buying a lot of neutral but cute baby fabrics as I’ve realised that neutrals are a big trend for babies right now, and they are also easy to gift to girls and boys! I love to make these as they are quite speedy and people seem to love them. There’s something about how small and cute the hats are! 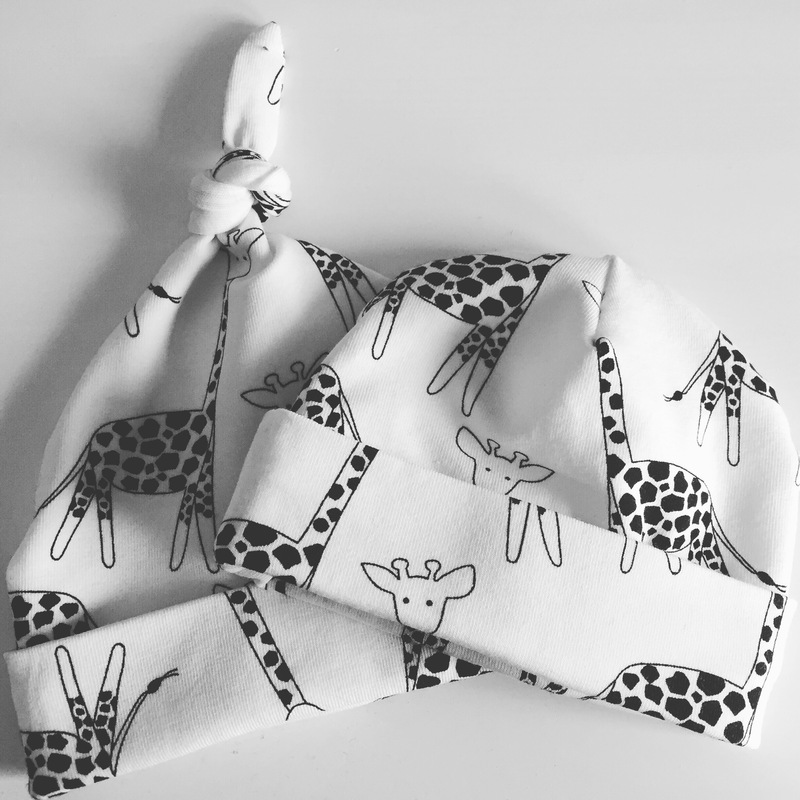 I line the dribble bibs with C.Pauli’s super soft white nicci velours, made with organic cotton. I could just spend hours stroking it. I can’t think of anything better to wear against soft little baby faces! 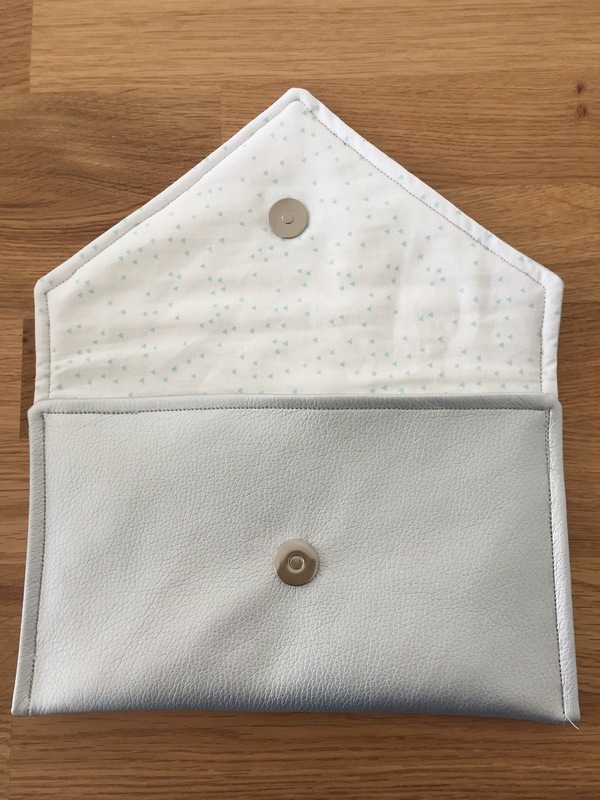 I also use two snap fasteners (sometimes three) so that these bibs can grow as baby does. Whilst I’m on the subject of C.Pauli I also used some remnants of one of their beautiful box kits to make these gorgeous hats. In-keeping with the neutrals theme, these proved very popular. I will definitely be making more of these as the fabric is so gorgeous. I’ve also had more success recently with combining the soft velours for larger bibs with a jersey top such as the one below. I’ve discovered that as long as the jersey is reasonably stable, you can still get a good finish without anything stretching out of shape. I’ve also discovered the cam snaps made specifically for jersey – these have that bit of extra grip for stretch fabrics and I would definitely recommend them! Anyway – that concludes my round up of latest baby makes. All of the makes featured have already found loving homes, but should you wish to order anything, just let me know! This one has taken me a while to get to blogging, but time to show you my second attempt at sewing Tilly and the Buttons’ Cleo Dress Kit. This time I ordered the dark denim kit, and I have to say, I am super pleased with the results. The fabric was a lovely quality, although I have to confess not quite the color I expected. From my perspective it is more of a dark navy than black, and I think Tilly has updated her kit description accordingly. 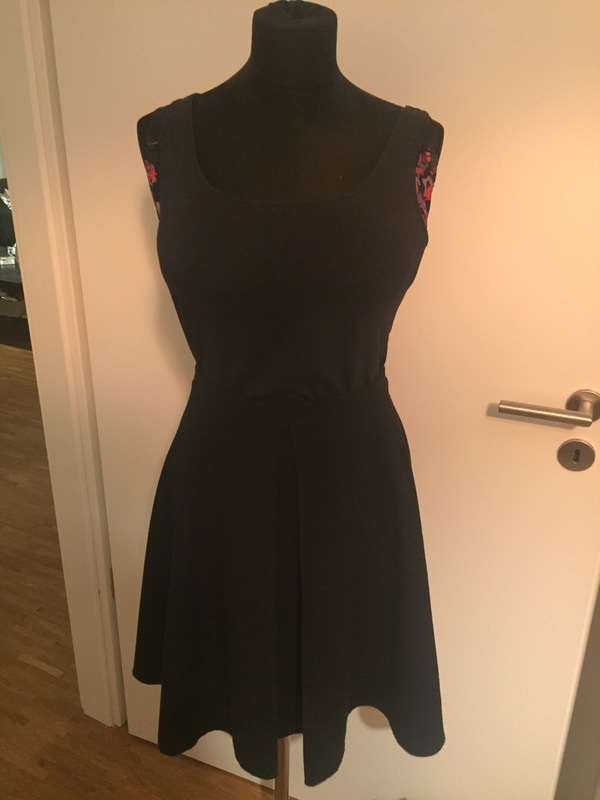 It was a pleasure to cut and sew and I think the finished dress will hold up well. I cut the same size as I did on my last Cleo dress, which still works well for me. The skirt is definitely too big, but very easy to take in on completion, so my strategy is just to sew it off and then chop off a good 3cm on each side seam with the overlocker. It’s no couture technique but it’s been suiting me just fine! I couldn’t believe it this time that I yet again had trouble with the facing. On my last Cleo, I’d accidentally forgotten that there’d been a printing mistake in the first pattern and had cut the wrong facing. This time I had all the right pieces, I just forgot it in my cutting layout and then didn’t have enough fabric left to cut the front facing. So frustrating! However, such challenges are a good opportunity to exercise creativity and resourcefulness. I decided to rummage through my fat quarter stash and see if I could find something funky that I could use as a facing instead. In the end I found some black fabric with different coloured spots – the final result has actually been really cool and it makes me smile every time I see it! At least I know my dark denim Cleo is definitely one of a kind! Maybe third time is a charm on this facing? Who knows! Saying that I’m not 100% sure I will make a third Cleo. I seem to love making them more than I actually wear them. For me, they’re definitely not something I could wear to the office, so they are limited to weekend wear. What can I say, sometimes on weekends I just want to pull on my jeans and not bother with tights and finding a co-ordinating t-shirt. I’m thinking that might change in the summer though where the Cleo will be nice to wear out and about on weekends. I’ll let you know! My lovely friend Kaitlyn recently took a trip home to the USA and when she came home I was lucky enough to be presented with a very cute gift. Kaitlyn had bought me a super cute fat quarter bundle of geometric gold and silver prints and it was love at first sight! The fabric is a reasonably heavy weight cotton and it’s been sort of screen printed with metallic paint. I wasn’t quite sure what I was going to use my fat quarters for until I unwrapped one from the bundle and had a brain wave. 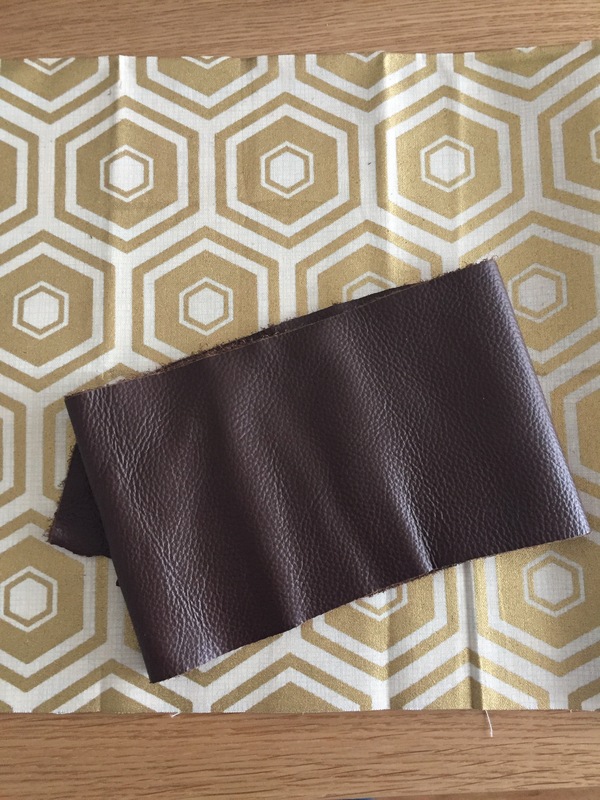 Why not combine the gold with some brown leather from my scrap leather collection? For me these two are a match made in heaven! I still can’t quite get over the fact I can buy a bag of scrap leather for 5 euros! You get some quite large pieces in there and I love the fact I find uses for them and they don’t end up thrown away! Also real leather really gives what you make an high quality touch! 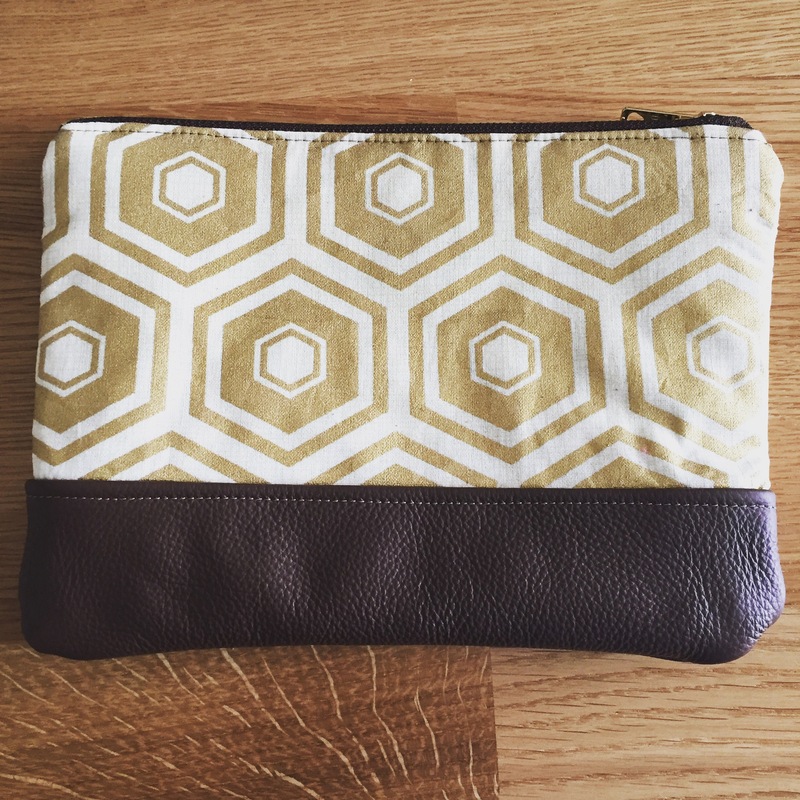 In my mind this pairing was crying out for a chunky gold and brown zipper – it just had to be done! I lined the bag with one of the silver geometric fat quarter prints, so it’s geometric metallics a-go-go! I basically made up making this as I went along. 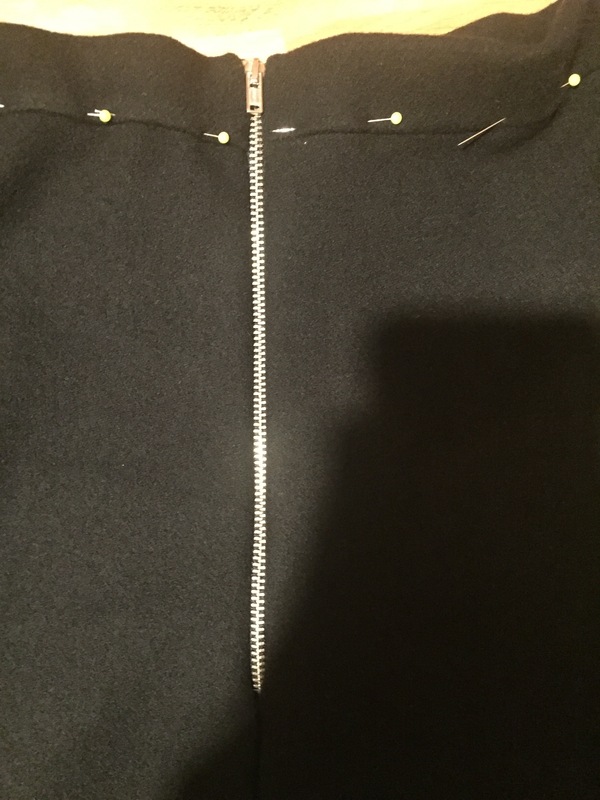 I cut the fabric pieces based on the zipper width and then just tried to work from my leather scrap in terms of good proportions. Check out my cute new scissors by the way in the above picture! Had to get them in there! For reference though – my cute new scissors only cut fabric. I find the best thing for cutting leather is a craft knife! 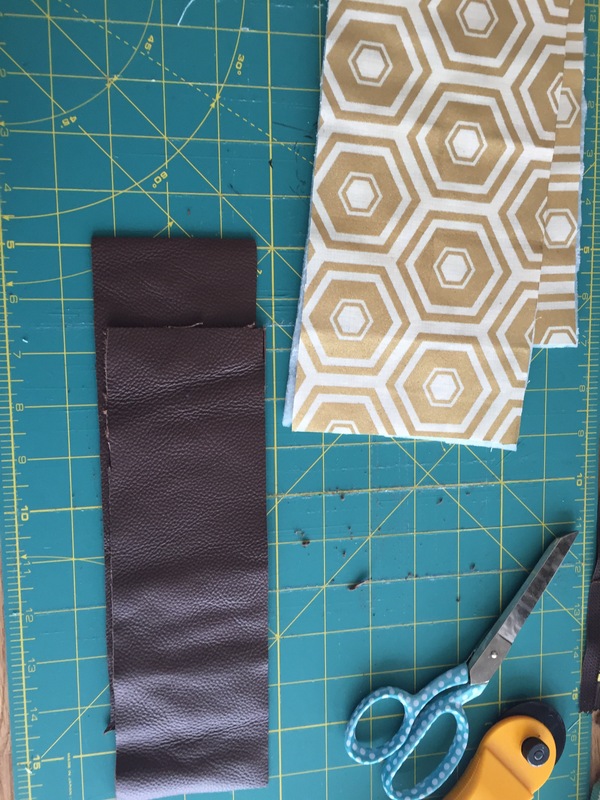 I stitched the leather pieces to the fabric pieces to make the two sides of the bags. I top stitched the leather to give a professional finish. This project came together just fine with a few minor rushing related mishaps, including breaking one of my leather sewing needles by trying to sew over my metallic zipper teeth (idiot!) Apart from the growing pains though I love the finished product! I’m currently using it to house all my make up, and am slightly regretting not making it bigger and using it as a clutch handbag! I’ve still got some fat quarters left in silver … so maybe a combination with black leather … hmmm ….. I’m feeling another project coming on! Bearing in mind just how much I love the Seamwork Brooklyn Skirt I can’t believe I seem to have omitted to blog about it the first time I made one. Having looked through all of my archives however, I can only conclude that this appears to be the case. I have now made 3 (yes count them, three) of these amazing skirts, and every time I make them, I fall in love with this pattern again. 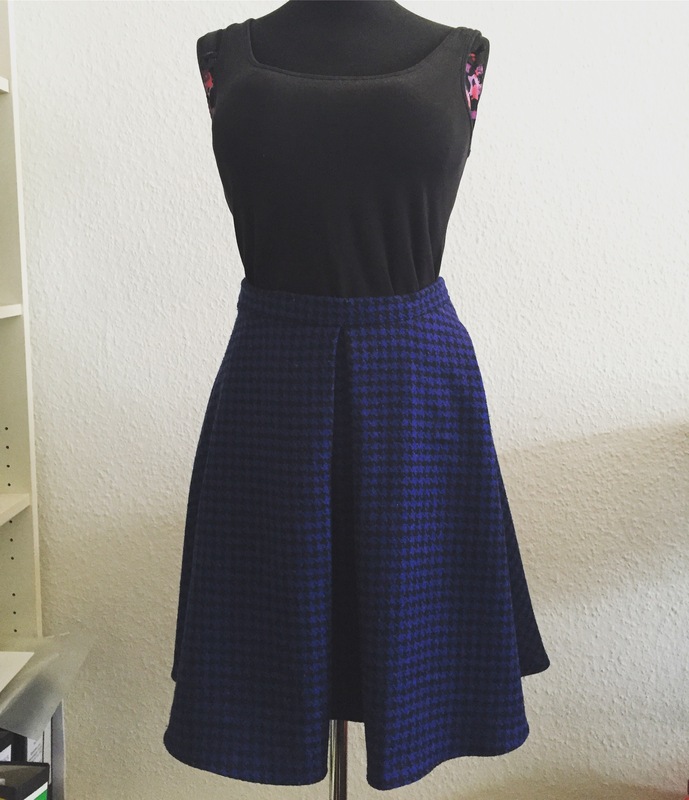 True to it’s pattern description, the Brooklyn skirt only take a few hours to make. If you have an overlocker it whizzes up even quicker! The only brain boggling piece is the box pleat, but once you have it down first time around it’s a breeze. I would be practically confident to say now that I could make one of these without looking at the instructions, it’s that simple! My first Brooklyn was made out of a grey wool mix, which is perfect for this skirt. You definitely need something a little heavier that holds the pleats and falls beautifully. My second Brooklyn was made out of some electric black and blue dogtooth wool that had initially been intended for a Tilly Arielle Skirt but I kept putting off using it because it was just too gorgeous. When I read more closely that a Tilly Arielle is best suited to something with a little extra stretch, I kept my beloved dogtooth for later. The perfect opportunity came when I was looking to do some stash-busting sewing due to lack of funds and I realised it would be perfect for a Brooklyn. Serendipity provided and I even had an electric blue 20cm zipper in my zipper jar (God knows what that was initially intended for?!) so I could sew this make entirely from my stash. This has become one of my all time favourite Brooklyns – I wear it frequently to work paired with some patent brogues and a long sleeved black T-shirt. I love the fact that it is almost certainly one of a kind and completely individual, and yet not so crazy that I can’t get a tonne of wear out of it. One of my other favourite things about the Brooklyn pattern is that this one fits me in a size 14 cut straight from the pattern, which is a miracle. It is like this skirt pattern was made for me! You’re probably getting the picture now – I bloomin’ love a good Brooklyn! Based on the amount of wear the grey and dogtooth versions get, at Christmas I decided I should make a black version. 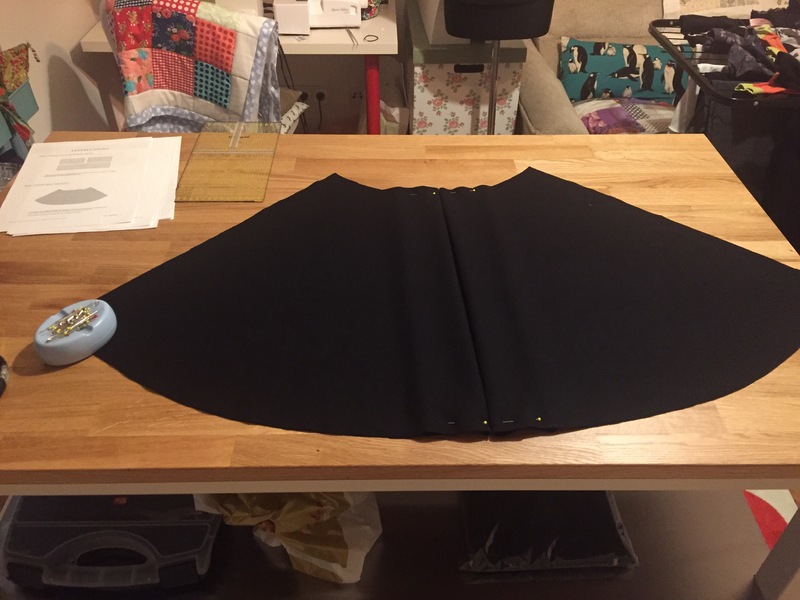 I don’t often sew black items – I don’t know, there’s just something I find totally uninspiring about buying black fabric. However, with the amount of coloured shirts and long sleeve T shirts I have in my wardrobe, I knew this one would be investment. I treated myself to some beautiful wool/cashmere blend which is super soft (and also happened to be on sale – yippee!) Sewing with cashmere gave me the fear a little bit as I just really didn’t want to screw it up and waste it. As it happens I now have a nice little remnant which I am thinking of using to make a teeny cashmere coat or matching but teeny skirt for my niece. We shall see! Making this Brooklyn was extra special for me as it was my first make in my new craft room (more on that to come!). I have to say, having my amazing cutting table (also known as the Ikea Stenstorp Kitchen Island) was every bit as awesome as I’d hoped. I love the metallic zipper on this skirt. It’s my little nod to a fun feature while sewing something black! So here it is, finished Brooklyn number 3. As you can see, Maud loves to wear a Brooklyn as much as I do! This skirt has been a really successful make – I wore it to our New Year’s Eve Party with a Denim shirt tucked in, and then today I wore it to work. It ticks a lot of boxes so I am pretty convinced it will become a long term wardrobe staple. I shall wear it until it falls apart! What about you, do you have any recommendations for other wardrobe staples? Or any patterns you return to again and again! Let me know, I’d love to hear from you! It’s nearly a New Year and it’s time for a bold new look! Having had my blog for over a year now, I thought it was time for a change. I hope my new look and name is reflective of a quieter and more professional sewing space! I still plan to post about new pattern releases and makes, but will also be adding some more information about options for custom orders and designs. As a result my blog will be a multi-purpose space – a diary of stitch creations and inspirations and a showcase of some of my favourite pieces! It’s been a quiet few months on the blog front these last few months due to lots of exciting life adventures. I moved to New York City for a month and left the joys of Frankytown and my sewing machine behind, which meant there wasn’t so much news to share. On my return, I was greeted with a lovely surprise of a proposal, so it has all been a bit of a whirlwind. All of this busy-ness hasn’t lead to a decrease in sewing, just a decrease in blogging my projects. I’ve been using the speedier method of posting on Instagram (@amyjune2015). As the summer rolls on things are starting to return to relative normality, so I wanted to share my new favorite past time – baby clothes. Ever since making the Spencer Dress I have become a total addict. As I haven’t had much time for sewing, they make great projects for when you have a spare thirty minutes or so. They’ve also helped me in my aim to make friends with my over locker as most of them are made with knits. I’ve been hunting around for some of my favorite patterns which I will link to in this post. The best bit – they are all free! There are so many amazing free baby patterns out there. I’d really encourage you to give them a go! So what have I made? 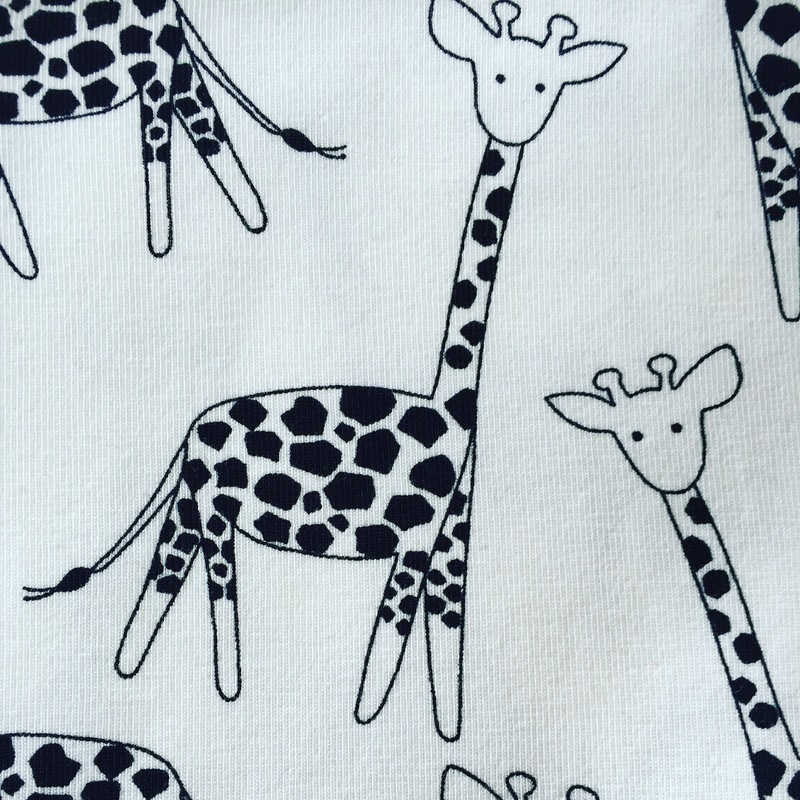 First up – I ordered 50cm of this really cute giraffe fabric online. I had a voucher from www.stoffe.de and was looking for something to make my free delivery allowance and just thought “ah well giraffes always come in handy”. These giraffes were the beginning of the craze! 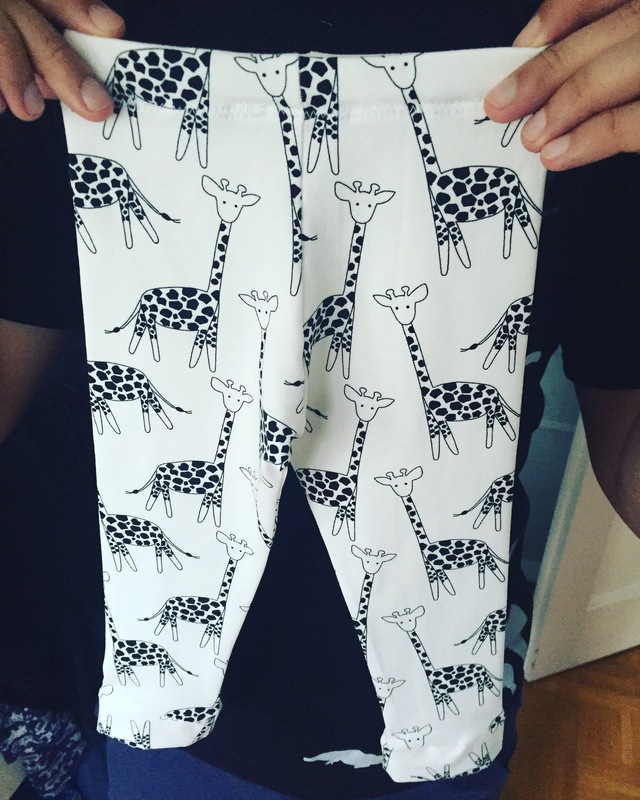 First I made some baby leggings using this free pattern. I have to say, the sizing of the pattern is 9 months and at the moment I am not convinced they will be big enough for my niece (who is only 7 months). Maybe I just don’t know anything about how small babies really are so we will see what happens. I’m looking forward to seeing if they fit! The pattern was super easy to follow and sews up very fast. The only thing I didn’t like about the pattern is it doesn’t suggest sewing a casing for the elastic. I don’t like the idea of exposed elastic on soft cute baby tummy so I added in a casing myself. They turned out ok in the end I think! I then received a message from one of my girl friends that this cute fabric store had a stall at the local street festival and they had crazy reductions on fabric. I whizzed on over on my bike and sure enough they had some great reductions on organic cotton jersey in the cutest of prints. I snapped up 50cm each of four different prints and figured I could use them to continue to fuel my baby clothes making craze. The fabrics are supplied by a German company called C Pauli. Be warned though, at full price these fabrics are on the luxury end of the scale for making baby hats! That said, this fabrics are a dream to work with and I think they give the final make a pretty professional finish. 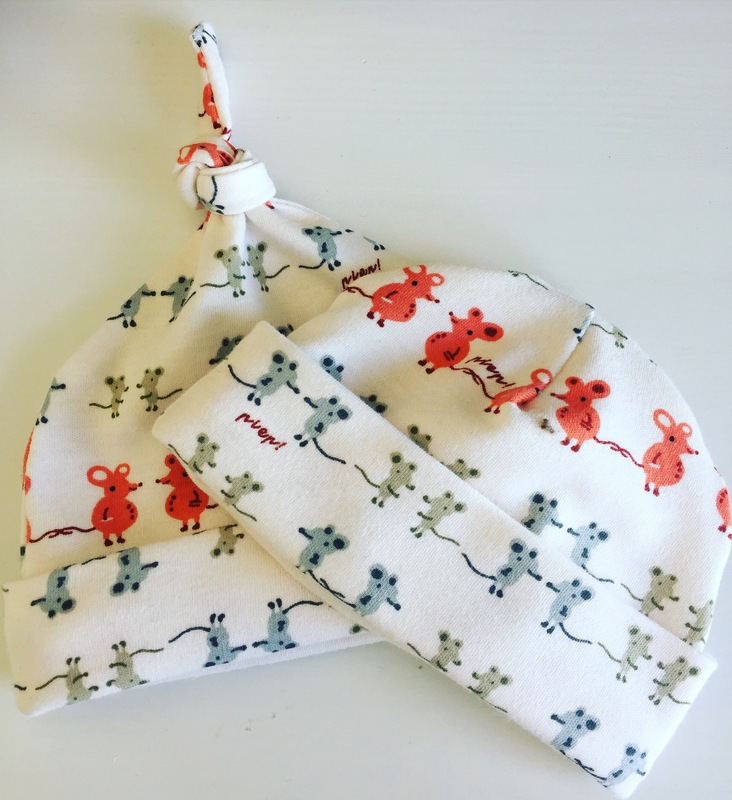 I love these baby hats – I’m half tempted to keep them for us one day, but I know they should really go to deserving colleagues! 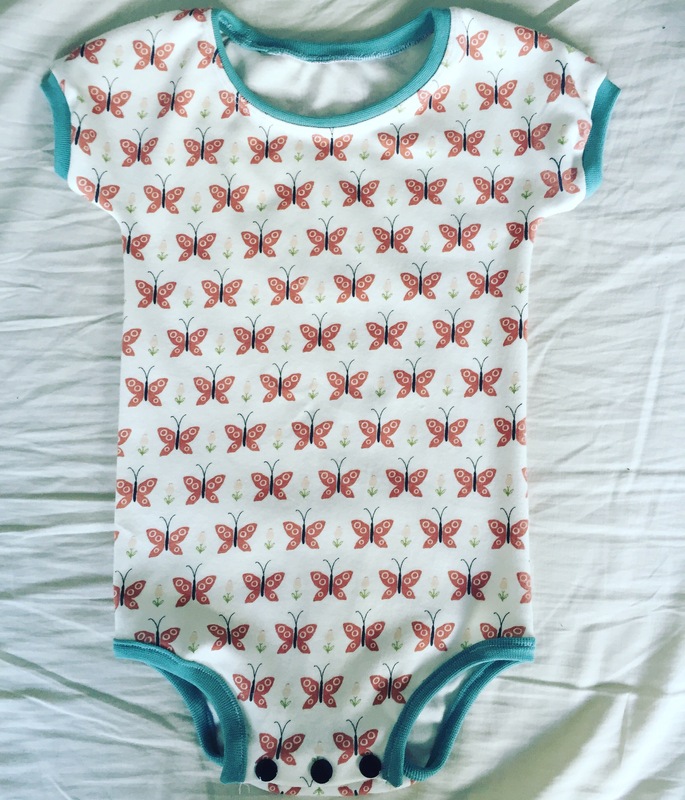 Finally my newest and favorite make – this adorable babygrow. This is made with more organic cotton from CPauli and I have to say, you can feel the difference when you work with it. It is just so soft and snuggly – hell I want to go to bed in this onesie! I love the print and I enjoyed working with this as it challenged me to learn a new skill. I’ve never done bias binding with a knit fabric before and I have to say a teeny tiny baby grow may not be the place to start. If I made this again I wouldn’t bias bind the neckline, I would just finish the neckline the way you finish a t shirt or any other jersey top with a neckband. It was super fiddly and hard to join the ends of the binding together which meant I ended up with a pucker 😦 this displeased me greatly! Apart from that though I love the final piece – I think it’s so cute and can’t wait to give it to my niece. I also loved having another opportunity to use my new favorite things – cam snaps! Check back for a post soon on how I’m using them on everything! Anyway that’s it for now – a bit of a long round up of baby bits and bobs! I can’t believe I love making baby things this much! May I continue to know lots of people who are expecting so I continue to have people to supply with gifts!